Collect data for use in analyzing visitor traffic and creating visitor reports. Visitor management is crucial to completing a secure work, study, or recreation environment. That is why Brady Visitor Badges LITE are crucial to a security conscious environment. Log-in visitor books no longer provide satisfactory visitor monitoring or lobby security. 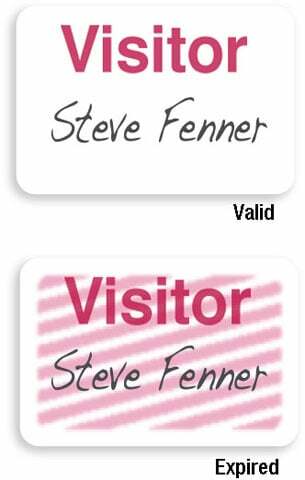 The professional solution is software that captures every visitor, records pertinent data, and issues visitor ID badges for easy recognition. 06103	 Visitor Badges LITE, Td One-Day Timebadge-Visitor. Sold in quantities of 1000. Priced per 1000 units. Call for price. The Brady 06103 is also known as Brady People ID	06103	.